Cook up a storm in a shiny new culinary space. Call us in Stirling, Stirlingshire, for bespoke kitchen designs that’ll enhance your cooking experience. Get the kitchen you’ve always desired with expert installers from J & W Builders Ltd. We offer a full design, supply, and fitting service. Our aim is to create the perfect kitchen for your lifestyle while still remaining within budget. 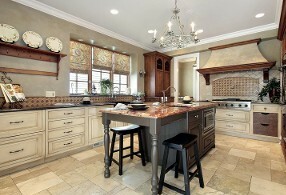 Your kitchen is the heart of your home, so we know how important it is to listen to what you want. We’ll transform your room into a living space the whole household will enjoy. Contact J & W Builders Ltd for bespoke kitchen designs that are created to suit your needs.